The model of choice for newspapers online was subscription. Users would pay a monthly / yearly fee to be able to access premium content, archives etc. This model was followed by the Financial Times, New York Times and many others. However, this model is being abandoned by the majority of its previous advocates. The advertising money that can be gained from increased traffic outweighs the money that can be generated from the subscription model. Removing subscription walls also allows Search Engine spiders to index a wider range of editorial (again increasing traffic) and having a free to access news site give greater scope for creative advertising solutions. 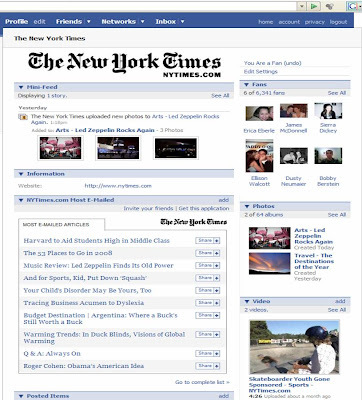 1) New York Times on Facebook - one of the first to start a Fan page on Facebook and one of the few users to do anything useful with it! The NYT posts stories (and allows them to be easily shared), posts photos / videos and encourages discussion groups around topical themes. 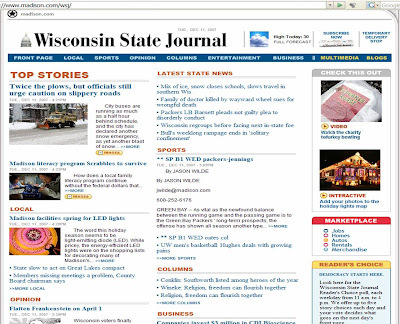 3) Wisconsin State Journal - at 11am each day website users are given the chance to vote for one of 5 different stories. The winning 'Readers choice' story is then run on the front page of the newspaper the following day. 4) Telegraph TV - the new multi-media Telegraph is now producing some high quality video under the banner of Telegraph TV. Running through a Brightcove channel the Telegraph host ITN supplied (Telegraph badged) news through their site in conjunction with Telegraph produced content such as Business TV and the Fantasy Football show. All content can be streamed from the Telegraph website or downloaded as podcast / mobisode. An interesting development from an 'established' newspaper and one that properly demonstrates how media channels are converging. 5) The Guardian podcasts remain popular but the most significant development has been 'Comment is free.' 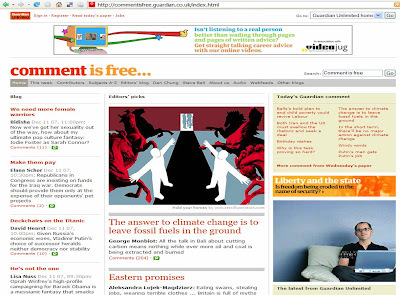 The Guardian were one of the first newspaper sites to encourage reader feedback through news blogs and a vast network of staff blogs and user comment now falls under the 'Comment is Free' banner. This has been one of the driving forces behind the online growth of the Guardian and helps keep content alive long after originally posted. 6) Axel Springer 'Avastar' Second Life newspaper - if people are to spend a long time in a Second Life virtual world, it stands to reason that they would like more information about it while they are there. Last year Reuters set up an HQ and installed a journalist ('Adam Reuters') to write about SL economics, but Axel Springer's idea is far simpler - give users an up to date, in-world, virtual newspaper! Available to download from the internet and through self-service boxes and street vendors inside Second Life. Whilst circulation may not be particularly large, this initiative has generated significant PR for the Axel Springer group. 7) Sun mobile - the Sun newspaper has been promoting it's mobile offering for over a year and looks to be in a good position to take advantage of the forthcoming growth in mobile. The Sun bought the mobile rights to the Premiership and whilst mobile screen-size has made it difficult to watch football highlights, the ability to integrate video highlights into Sun mobile games is very interesting. The Sun are pushing a range of initiatives from mobile bingo to mobile news and mobile gaming. The strapline on the Sun's advertising is now 'Paper - Online - Mobile' and this is definitely a publisher to watch. 8) Aftonbladet diet club (Aftonbladet viktklubb) - in 2005 traditional Norwegian newspaper publisher Schibsted made 35% of it's revenue online. This raised eyebrows at publishers across the world and led many to accelerate the development of their digital portfolios. Schibsted had experimented in many areas across Scandinavia - classified in Finland, a Search engine to rival Google and notably a diet club through the Swedish newspaper Aftonbladet. Whilst others were struggling to monetise news content, Aftonbladet quickly realised that people would pay to be part of a diet and fitness club. The literal translation is 'weight club' and it is still running strongly today. Sweden's Dagens Nyheter newspaper has launched a mobile phone that offers subscribers free access to its website. They aim to give readers access to Dagens Nyheter content on the move. Dagens Nyheter readers apply for a Nokia 6120 through the Dagens Nyheter website and sign up to a monthly subscription of 199 kroner (around £15 per month). Aswell as a being a standard mobile package, the phone has a DN button that allows immediate and free access to the Dagens Nyheter website. Handset manufacturers having been moving closer to content (Nokia Music etc), this is an interesting example of a content provider moving closer to handset manufature / distribution. none of these newspapers are anywhere near as good as the mail.